Australia is experiencing population growth in its capital cities. The Federal Government is thinking of adopting a plan for encouraging International students to study in regional universities instead of studying in major cities. Additionally, some experts in the subject feel that there is a need, of more incentives, for making it a practical option. Australia attracts extraordinary numbers of global students, who choose to settle in its capital cities. The data of Australian Bureau of Statistics reveals that 786,000 international students were enrolled in its universities in 2017. Only 3 percent among them preferred regional areas but the Government aims to increase that percentage. PM Scott Morrison is considering a plan to force the international students for studying at regional universities. The aim is to decrease overcrowding in Melbourne and Sydney. He also talks about the need of specific areas. In Adelaide and in the north, there is a need of more population but in the outer suburbs of Melbourne and Sydney, they do not need it. There are ample levers to manage population, and the Government is working strongly on the relevant issues, says PM. Annabelle Duncan, Vice-Chancellor, the New England University Armidale, spoke regarding the various advantages to regional study. Furthermore, English is the common language spoken by all the global and domestic students. It will help them to interact with the people in the local community. This will also lead to getting a true Australian experience. 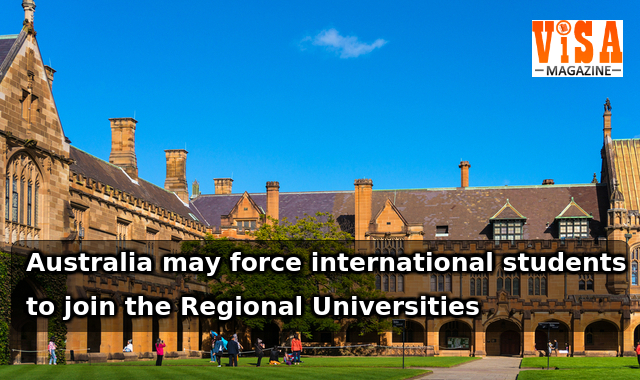 Regional Universities welcome the proposal as a way to move forward, but a domestic body, representing international students’, feels that these universities do not have the required facilities now, to make it a viable proposition. Bijay Sapkota, President of the Australian Council of International Students, feels that such a measure will deter students, to take up studies in Australia totally. Another important point is that the Regional Universities may not have all the necessary and good courses, similar to the City based Universities. Besides there will be few opportunities, for carrying out work-integrated learning. The reason is that major corporations are established, in urban areas, and not in the regional areas. We at VisaMagazine will bring a series of updates, and notifications, regarding all these matters. Please stay in touch with us.